“It’s not about healing the world by making a huge difference. It’s about healing the world that touches you, that’s around you.” Rachel Naomi Remen, excerpted from Krista Tippett’s book ‘Becoming Wise’. So if it’s not about becoming famous, or stumbling on the cure for cancer, or inventing something that will top Post-it notes, or even about getting more ‘likes’ than the next guy, what’s it about? What does healing the world that touches you actually mean? The concept of showing up has been with us for thousands of years. In the 70’s, Ram Dass said it really well in his best seller ‘Be Here Now’. Today we have books and classes and training programs to help us learn to be more mindful, to simply ‘be here now’. Clearly it’s not the no-brainer it appears to be at first glance or we’d have it mastered. Minding your own business is a great idea; however, we seem to have it turned around. In ‘The Work’, Byron Katie said something like this: “Most of us spend 99.9% of our time and attention in either God’s business or everybody else’s business, leaving us about .1% of our time and energy to manage ourselves”. So minding your own business, another idea that appears relatively clear-cut, isn’t. To further complicate matters, if we let God and everybody else handle their own business, that still means we need to manage ourselves. Which requires a degree of self-awareness that most of us haven’t achieved, especially if we think we have. How’s that for brain draining?! And finally, its no surprise that figuring out how to do the next right thing is kind of a nightmare. With the world in seeming chaos, with everybody pulling at us to do what they want us to do, and with so many choices it’s hard to figure out which catsup to buy that won’t either kill us or support some terrorist country, how on earth can we figure out what the next right thing is? And even if we are able to figure it out, how do we find the time do it?? And then how do we do it again, and again, and again? I think the trick is to worry less about finding a definitive answer to any of the questions, and to focus more on continuing to ask them. How do I, one little speck of humanity amidst millions of specks, heal the world? How do I show up, mind my own business, and do the next right thing, day after day after day? 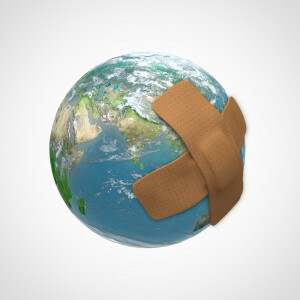 One big, dramatic gesture that gets me the most ‘likes’ is not going to heal the world. But many small, open-hearted and courageous actions that reflect how I want the world to look, just might. We can’t wait for the world to change. We are the change. We all think we’re not enough — but what if we are? What if we are enough just as we are — and recognizing that is actually how we’ll end up healing the world? Robyn, thank you for this gentle but very powerful reminder. Yes it does seem simple enough and if I just take a few minutes to breathe and allow the principles here to guide me instead of the chaos that I allow my thoughts to keep focusing on I will be more of the calm, centered person I ultimately want to be.